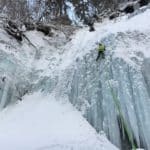 Ice Climbing day trip accessible from Sapporo. 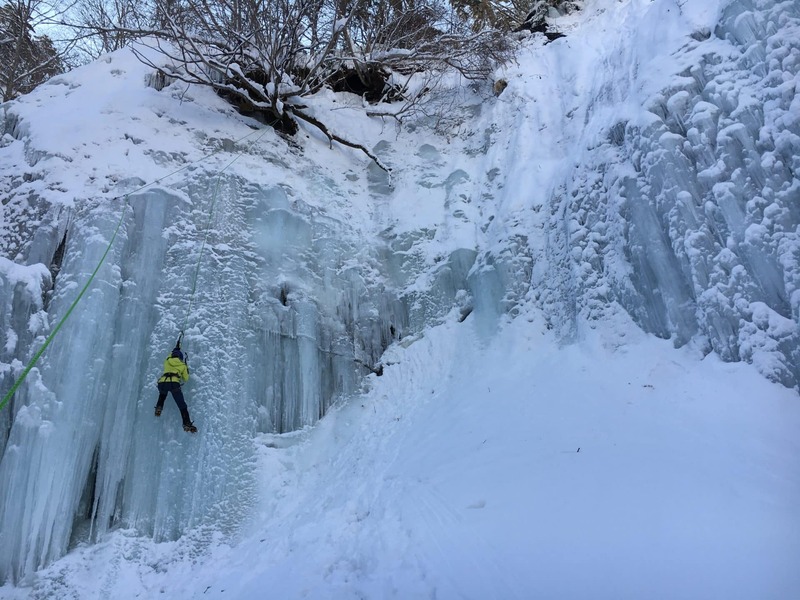 Discover the secret ice climbing spots of Hokkaido! 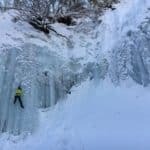 I introduce to you a 1-day ice climbing programme at my secret ice climbing spot that is only a 1-hour drive away from Sapporo city and 45min approach in snowshoes. If you’ll be staying in Niseko, I could pick you up there as well but please note that you will have to pay an extra to account for transportation costs. 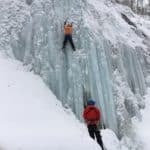 Here, you can challenge yourself with 4 different short but vertical ice fall routes 15m high. 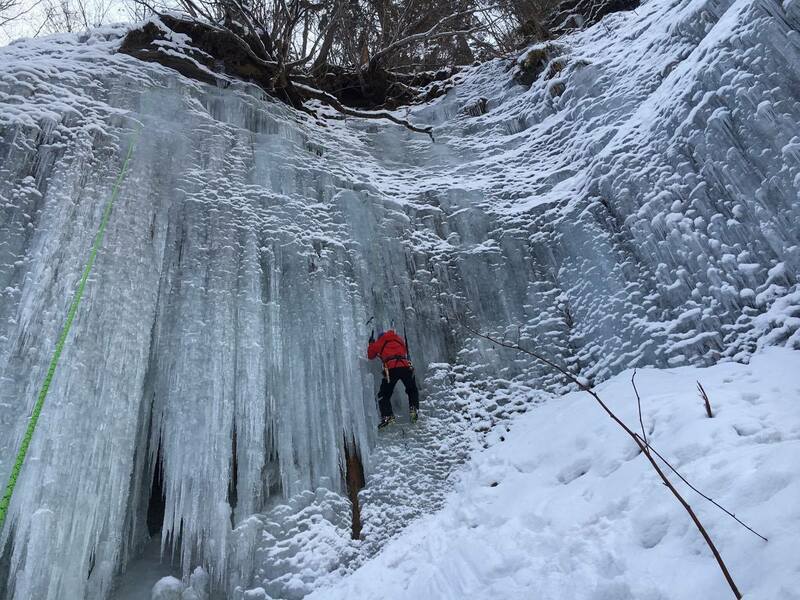 The ice climbing grade here is WI4+ (highly technical WI4) and will all be on top ropes. The best period to enjoy the ice falls here is from the beginning of January until about end of February. Beginner / Intermediate – You will need to have had a prior summer rock climbing experience, as you would need to know how to belay someone. You need to be fit enough to walk the 45min approach. 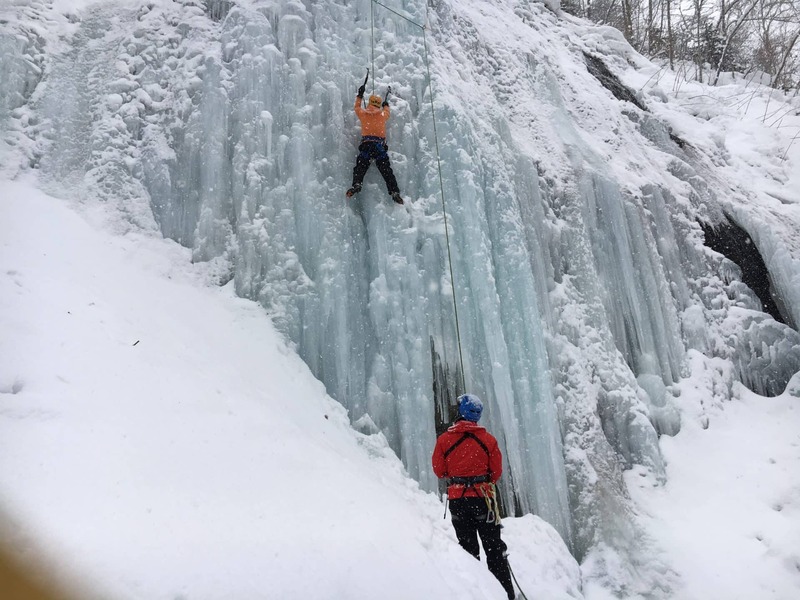 Beginners to ice climbing are very welcome! 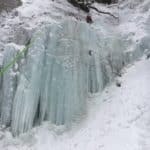 I offer ice climbing programmes in other areas so please have a look! If you’re after a more challenging course then join my ice climbing programme for more experienced / advanced ice climbers. 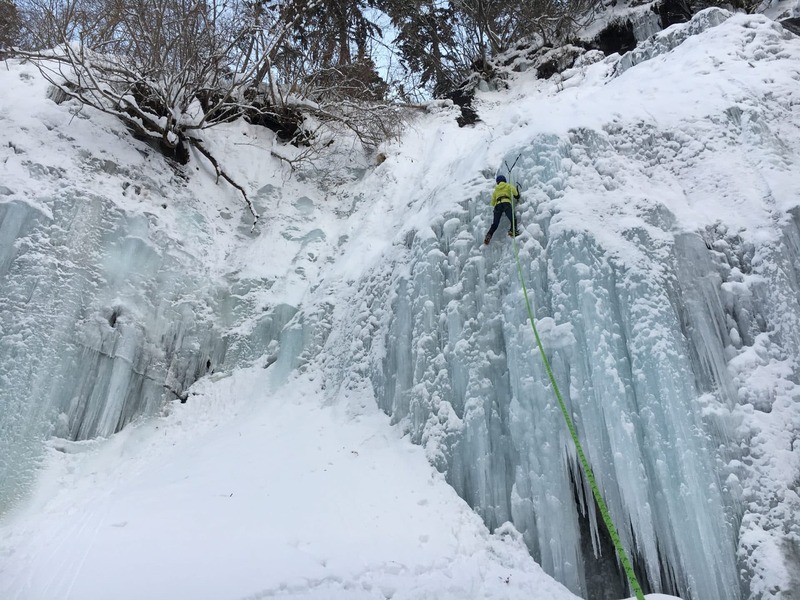 Or, why not join the popular 2-day intro to ice climbing at Sounkyo! Items such as ice axes, harness, helmet, and crampons can be rented at JPY 2,000 each. Snowshoes and poles are necessary for the approach and can be rented at JPY 1,000 a pair. Other ice climbing gears such as ice screws, quick draws etc. will be provided.If you’d like to lead (and not follow) then please bring your own gears. 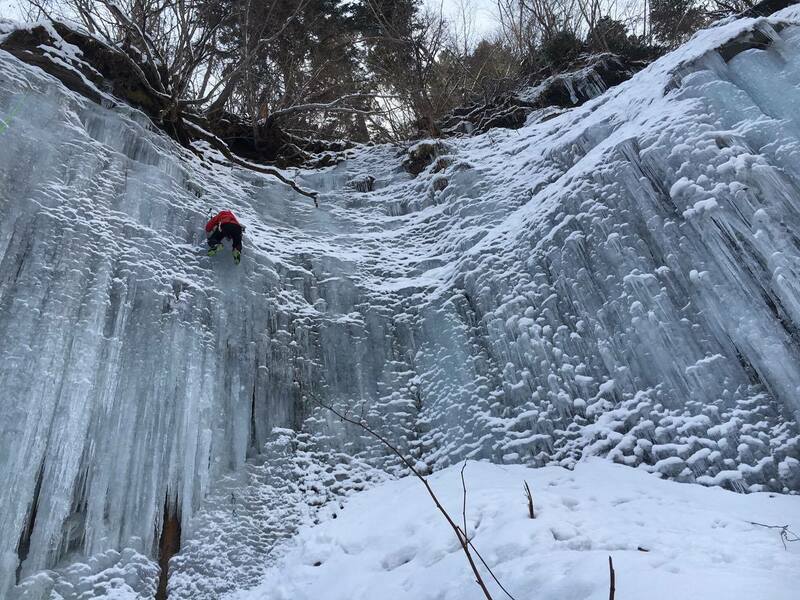 Contact me if you have a free day in Sapporo and are interested in joining me on this ice climbing programme! – Route Inn Sapporo and Sapporo Aspen Hotel: Food not included. JPY 8,000-9,000. – Sapporo Grand Hotel: JPY 10,000-20,000. 8:00am – Meet at Sapporo and depart. We will drive for about an hour to our destination. A 45min approach by snowshoe trekking will take us to the ice fall! 4:00pm – We return to Sapporo. You can be dropped off at Sapporo station or your accommodation in Sapporo. 8am departure from Sapporo. Please let me know if you are staying at a hotel in Sapporo or arriving from other places, like Niseko, to Sapporo in the morning. Then we may be able to delay the departure to match the train arrival time. - Goshiki Onsen: An Onsen accommodation in the mountains, far from ski resorts. Self catering JPY 4,000. Half board JPY 10,000. - The Woodpeckers: mountain hut-like accommodation, just below Niseko Moiwa ski resort. Half-board included. JPY 7,500. - Ryounkaku: Half-board with onsen. JPY 10,000. In case of bad weather / conditions (including road conditions), the trip itinerary may be altered and/or date change can be discussed. Riding on the guide’s car is considered as ride sharing and thus will only covered under normal car insurance. The guide’s responsibility and liability is only applicable from the departure from the start of the approach path until our return to the same point. 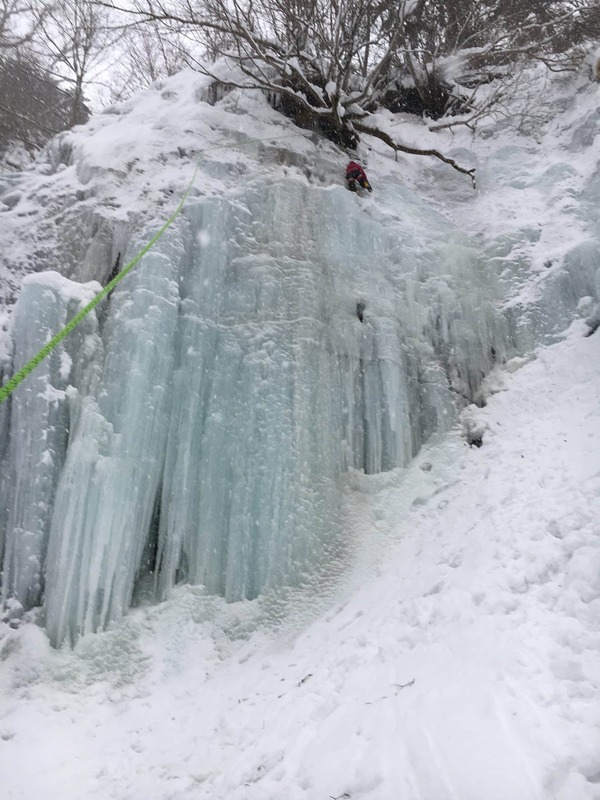 Please make sure all participants are individual insured appropriately with international travel insurance which specifically covers ice climbing. For any injuries in the mountains, the guide will not be liable and will need to be paid by your own means.